Without any doubt, this is the best book on coarse fishing written in the second half of the twentieth century and it hasn’t any rivals in the twenty-first either. A classic story of one man’s quest for carp, but told the way only Chris could tell it - this is a tale that even someone who had never held a rod in their hand in their life can enjoy. 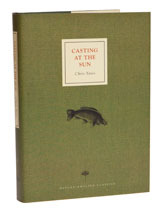 Casting at the Sun is as much about what drives people to go fishing and what it feels like to fish as it is about his eventual catch of a record carp, so even if you are a fly fisherman through and through, you should buy this, because there are very few books on angling that even get close. Bears comparison with Farson’s Going Fishing, which is saying something. This book has very deservedly been in print ever since it was first published and I am only partially kidding when I say that Casting at the Sun drips with atmosphere to such an extent that it will leave your hands smelling of fish by the time you finish reading it.